We know Les Houches well and were looking for somewhere close to the Bellevue lift, this was perfect at about 100m! Also close to our favourite pub the Kitsch inn. Apartment was perfect for 4. We were 5 and while the sofa bed was a good size it was a bit of a squash for eating etc. We're pleased you enjoyed your trip to Les Houches. We feel the location works well for both summer and winter with the proximity to Bellevue Lift. We do describe the apartment as sleeps 4 best. Bed sheets are included as Hotel room. Fresh air & calm allow to sleep in peace in summer. Chamonix is a spectacular place with multipasses. You can rent with trust. Simon & paula have been more professionnal than some Hotels. We're pleased you enjoyed your summer stay in Les Houches. The position of the apartment facing the mountain makes it very peaceful with just the sounds of the birds in the morning. Nous sommes heureux que vous ayez apprécié votre séjour d'été aux Houches. La position de l'appartement face à la montagne le rend très paisible avec juste le bruit des oiseaux le matin. Great location for exploring the area and well eqipped. Made full use of regular bus service, free with guest guard, and bus stop 50yrds from apartment. Greatly appreciated extensive collection of English DVDs during the rain! Clean and comfortable appartment. 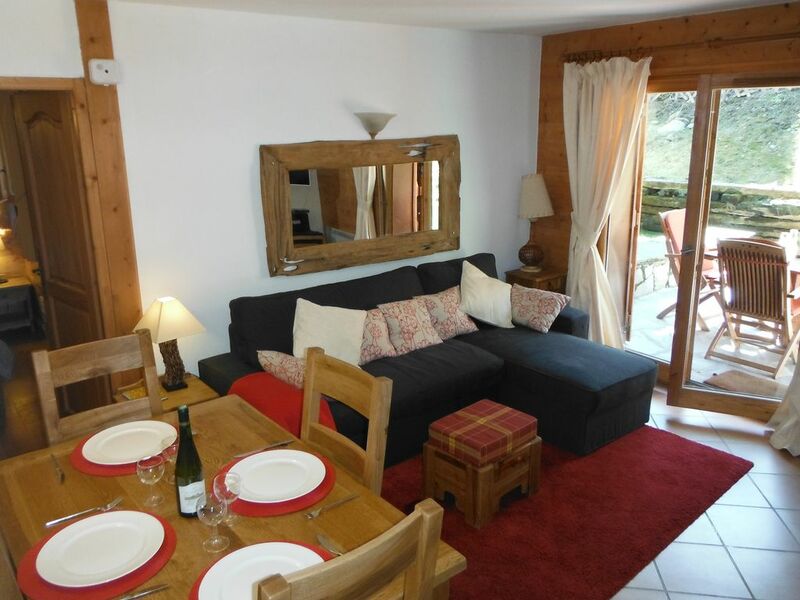 We're pleased you enjoyed your stay in Les Houches and found the apartment both well equipped and well situated to explore the Chamonix Valley. I'm also pleased you found the DVD collection entertaining during wet weather. We look forward to welcoming you back for future vacations. --- in catalan -- : Apart-hotel molt confortable, dues habitacions complertes, armaris, banys, molt net, cuina equipada amb rentaplats i tot, tv, internet... Varem estar 8 dies i varem estar molt be. Hi ha una sortida exterior on es pot estar just a continuació de la sala d estar. Tenen una TV grossa , amb connexió a internet i un munt de pelicules en DVD ( en anglès això si) que podràs mirar. M he guardat les dades per recomanar-ho a familiars i amics que vulguin anar-hi. Per anar a Chamonix hi anavem en cotxe particular ( hi ha uns 5 o 6 km) tot i que si pot anar en transport public de forma gratuïta amb un document que s aconsegueix a informació i turisme . We're pleased you enjoyed your summer holiday in Les Houches. As it's our holiday home, we have fitted it out with a little more equipment than the usual rental property and are happy for guests to enjoy our facilities. We look forward to welcoming you back for future vacations. The owners have really thought about everything one needs. The apartment was clean and well laid out. The position was great for access to The Bellevue cable car and to have a restaurant as good as Le Basilic nearby is a real bonus. Paula was very responsive to any questions we asked. All in all, a really good experience. Thanks Paula. We are pleased you enjoyed your stay. The close proximity to Bellevue Lift Station was one of the main reasons why we purchased the property. We look forward to welcoming you back should you visit the Chamonix Valley again.